It’s been a little while since I have done a ‘book versus movie debate’ post but as I have recently read The Stepford Wives I figured that rather than just share my thoughts on the book, I would do a book and film comparison instead. There are two film adaptations, one was released in 1975 and the other in 2004. I confess that I haven’t seen the 1975 offering (although I really want to, it’s on my to-do list!) so the film I will be referring to here is the 2004 adaptation. As I usually do, I will begin with a brief explanation of both the book and film for anyone that hasn’t already read/watched it. I hope you enjoy reading this! 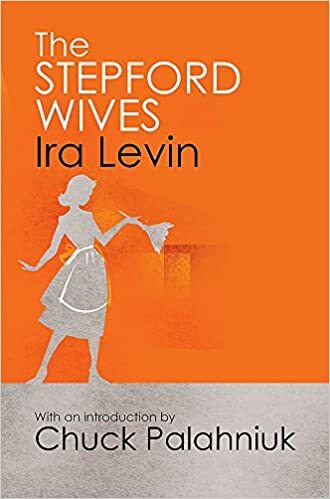 The Stepford Wives was first published in 1972 and is written by Ira Levin. The story follows Joanna Eberhart, a part time photographer who has just moved to Stepford with her husband and two children. As time progresses Joanna becomes increasingly suspicious of the ‘perfect housewives’ who only wish to clean and shop at the grocery store. Is this an innocent place or is there something more sinister at play? Joanna makes it her mission to find out. This particular adaptation was released in 2004, directed by Frank Oz. Again the story follows Joanna and her family as they relocate to Stepford. Similarly to the novel, Joanna is suspicious as to why the housewives are so ‘perfect’, submissive and only concerned with waxing their floors. Joanna believes that something dangerous is going on and she is determined to figure out what that is. From here I will explore the main differences that I have picked out between the film and the book as I attempt to answer the question: which is better? There are quite a few differences in characters, whether this is simply their names or entire characters that are completely changed. Who am I referring to? Well, in the novel we meet Ruthanne and her husband Royal, the first and only black residents of Stepford. It appears that these characters were introduced to cast a light upon racism within everyday society and we witness how Ruthanne believes that the wives are cold towards the prospect of socialising with her not because they have been changed by their husbands but because she is black. In the film there is no Ruthanne and Royal, instead we are introduced to Roger and his partner Jerry. The underlying racial issue is replaced with one regarding homophobia instead. I believe it is possible that this change was made to reflect the society of the time. This is not to negate the issue of racism, not at all, but the discrimination of gay people was simply not the issue in 1972 that it was in 2004 and still is now. It’s difficult for me to answer if this change annoys me or not. I am completely happy to see the introduction of a gay couple and I do feel it was necessary, however I don’t believe this needed to be at the expense of Ruthanne and Royal. I suppose what I am trying to say is that I would have liked to have seen both couples in the film. In the book Joanna is a part time photographer and she continues to work after her move to Stepford. Indeed it is through her photography that she begins to suspect that something untoward is happening up at the big old house that the men meet at. In the film however, Joanna was a high flying television executive who is prompted to move to Stepford by her mental collapse following being fired from her job. 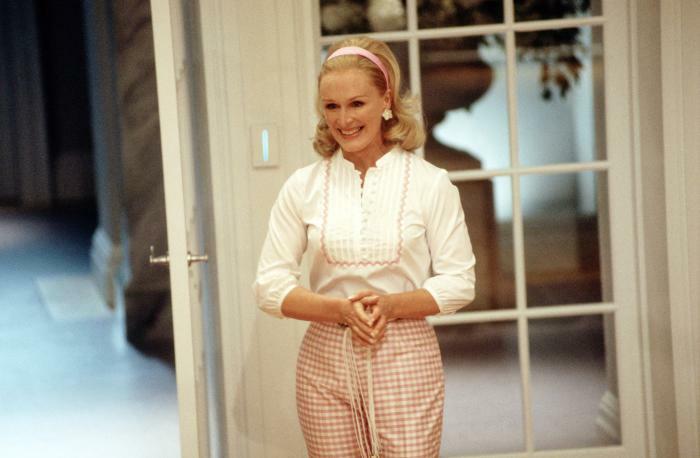 Joanna remains unemployed in the film and this contributes to her struggle to adjust to Stepford life and indeed contributes to her quest to discover why all the previously independent and career driven women are now submissive housewives. This change is not one that I had any issue with. I think it is a reflection of the times that the 2004 film was updated to include a full time career woman versus a part time photographer. What is important in both is the idea of the woman leaving behind her career and morphing into a completely unrecognizable personality. Therefore, the career that is left behind and whether it is full or part time is not the important point here. In the book it is particularly vague as to how the women change from their previous selves into the ‘perfect Stepford housewife’. It is clear that changes are taking place, particularly when we take into account the character Bobbie. Bobbie is introduced to us as a strong woman who is less than concerned with housework and married to a man who knows better than to tell her what to do. Much like Joanna she suspects that all is not as it seems in Stepford and much like Joanna she is desperate to move away before whatever ‘curse’ there is at play claims her as a victim. In fact, she is more eager than Joanna to get out straightaway! Time really is of the essence. This is all until Bobbie and her husband have a ‘second honeymoon’ at home one weekend and Bobbie returns transformed. She is docile, obedient and completely consumed with getting her house in order. This juxtaposition is all the proof that the reader needs that there is something suspicious happening and yet we are never told what exactly that is and how it comes to be. Levin leaves it to the reader to draw their own conclusions. In the film however it is laid bare for us to see. We are aware that the wives are turned into remote-controlled robots that can double up as an ATM because we are shown this and towards the close of the film we see the control room as Walter destroys it to return the women to their pre-chipped selves. As much as I like the ambiguity of the novel, I must admit that when watching a film it is exciting to see lots of action and so I did enjoy watching how the women change and I did find the ending fun if somewhat dramatic. I suppose my overall opinion is that I enjoy different outcomes from different sources. If I’m reading a book I like to fill in the blanks myself but if I’m watching a film then I would prefer to have it fully laid out for me. In the book it is solely the men that through their association turn the women into what they want them to be. Contrastingly, in the film, the character Claire is the mastermind. She has long ago turned her husband into a robot ‘Stepford husband’ following his affair. Her success led her to decide that men wouldn’t stray if their wives were ‘perfect housewives’ and thus her goal and mission became to transform all of Stepford. She uses her ‘Stepford husband’ to convince the husbands that it is a good idea to transform their wives and she herself manages the wives who are, unbeknownst to them, being prepared for transformation or have already been transformed. This is an interesting change from the novel and again I suspect it could be to do with the passing of time. Perhaps the film is attempting to show that women can be equally as responsible for the stunting of feminism as men. I don’t like this change however. I don’t find it entirely necessary and once I had read the novel and compared this in my mind to the film, I found I was annoyed that Levin’s vision was changed so much. COMEDY OR SOMETHING MORE SINISTER? The film has many comedic elements. In fact, I find myself giggling at multiple points throughout, every time I watch it. The book is not at all funny however. It is frightening, sinister and threatening. The book simply shows one by one the women changing and we don’t know why or how this happens or who is next. Nobody is safe, and everybody is at risk of the ‘invisible attacker’. As a woman I found it a really unnerving read! I just don’t get the same feelings from the film. It is simply more amusing than scary. I much prefer the book with regards theme. I like that the book left my heart beating a little faster, it was far more thrilling and enjoyable than the film! Having said that, I didn’t hate the comedy of the film, in fact I enjoyed it until I finally read the novel and so it is hard to be entirely sure which is better. I do think the book just clinches it with this though. And that’s it, the main differences that I noticed between the novel and the 2004 film. Are there any others that I missed? Ok, this is not easy to answer! From a story perspective I absolutely have to say the book is better for me! However, I really love the film as well, it has been one of my favourite films since I first watched it and it still is now, even after reading the book and doing this comparison post. If I had to pick one I would say the book is better, I feel the construction is more thought out and polished than the film. However, the film does give me what I look for in a movie: action and excitement. Contrastingly the book provides suspense and mystery which are two elements I really enjoy when reading. Overall, I would say it will all depend on my mood at the time as to which I reach for next time I want a dose of Stepford. What did you think of this post? Do you agree or disagree with my musings? I hope you enjoyed reading this, I will leave links below to the other installments in this series if you haven’t read them and would like to.